The 4A's High School Initiative provides a pipeline of diverse talent, ensuring the future success of our industry. We have two New York City advertising high schools (IAM & MECA) that foster a culture of curiosity, intelligence and know-how to fuel the creative class of the future. The program encompasses dedicated classes ranging from Intro to Advertising to Graphic Design. It also seeks to maximize industry engagement through speakers, off-sites to agencies, mentoring, competitions, networking events and internships (summer, fall and spring semesters). For more information, please contact Al Benoit at abenoit@aaaa.org. Students from IAM and MECA attend The Face of Talent 2016. Students from MECA brainstorming for 2016 ReACT competition featuring Reebok. Students from IAM finalizing for the 2016 ReACT competition featuring Reebok. 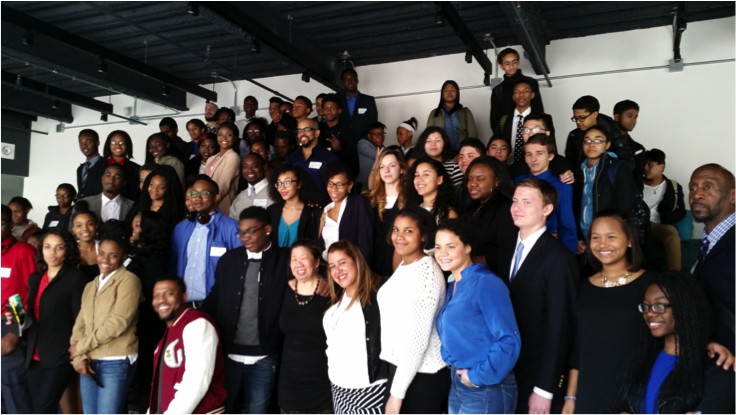 Students from IAM and MECA attending the 2016 Career Day event (panels and speed networking) at Initiative NYC.